One of the best films I saw at this year’s Sundance Film Festival was writer-director Brian Klugman and Lee Sternthal‘s first feature, The Words. 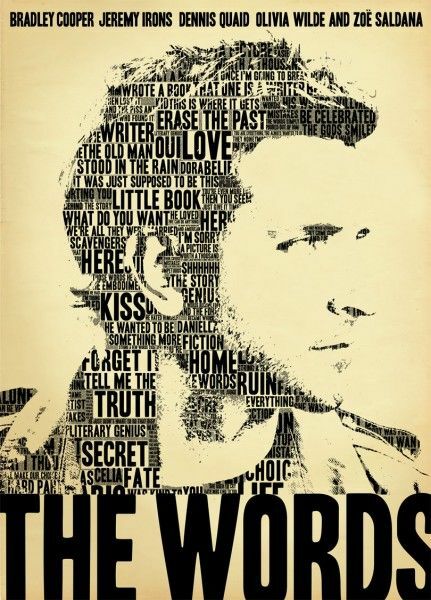 The film stars Bradley Cooper as a writer who, after discovering an extraordinary lost manuscript, passes the work off as his own and receives overwhelming critical acclaim. Jeremy Irons plays the man who originally wrote the manuscript, and the film weaves multiple narratives to tell the story. The Words also stars Zoe Saldana, Dennis Quaid, Olivia Wilde, Ben Barnes, and JK Simmons. CBS Films bought the film after its first screening and they plan to release it later this year. It’s definitely a film you should be excited to see. For more on The Words, here’s Matt’s review. Shortly after seeing the film, I did an extended interview with Bradley Cooper and co-writer-director Brian Klugman. We talked about being at Sundance, how the project came together and how it changed along the way, deleted scenes, how the two of them became friends (they’ve known each other for decades), karaoke, film versus digital, and a lot more. In addition, Klugman talked about his early draft of Tron: Legacy, and Cooper talked about what it was like to work on director Derek Cianfrance‘s The Place Beyond the Pines, and the status of Paradise Lost (it’s hopefully filming this June). Hit the jump to watch. As usual, I’ve time indexed the interview so you can watch the parts that interest you. And if you missed my video interview with Ben Barnes for The Words, click here. :16 Klugman and Cooper pull Steve on camera to showcase his Threadless T-shirt. 1:03 Talk about the Sundance experience. They developed the script at the Sundance screenwriter’s lab in 2000. 1:29 Cooper tells a funny story about bringing Wet Hot American Summer to Sundance and writer-director David Wain constantly referring to it as the Suntans Film Festival. 2:35 How much of the project changed from when they first wrote the script to the finished film? Cooper first read the script 12 years ago, but the bones of it stayed the same. 3:42 Briefly describe what the movie’s about and who Cooper plays. It’s a romantic drama seen through the lens of three different characters and their lives. Cooper plays a writer who comes across a manuscript that he didn’t write, and turns it in as his own. 5:49 How many takes does Cooper prefer to do? Says it’s a case-by-case basis depending on a bunch of factors. If it’s a small budget and time is of the issue, fewer takes are necessary. 7:46 What’s their go-to karaoke song? Klugman says Neal Diamond and Cooper says Led Zeppelin. 8:17 Film or digital? Klugman says The Words was shot on both. The Paris 1940s stuff was shot on old film with old lenses, the Cooper and Zoe Saldana stuff was on film, and the Dennis Quaid/Olivia Wilde scenes were shot on the Alexa (digital). Klugman and Cooper both prefer film. Cooper says film adds to the limitations aspect of filmmaking that pushes the actors and crew, but he says he’s really doesn’t care as it’s really about the director. 9:53 Deleted scenes. Almost no scenes were deleted from the film; there are only a few scenes that were truncated. The Words was so structured that there wasn’t much that could be taken out. 10:33 How did Klugman and Cooper meet? Cooper transferred from public school to private school and met Klugman there. They bonded because many of the other kids were wealthy and Cooper and Klugman were outsiders. 12:25 Cooper talks about working on The Place Beyond the Pines. Says it’s a very structurally ambitious film. 13:51 The filming dynamic. Talk about the fractured filming schedule. They shot all the Cooper and Saldana stuff up front, then shot all the Cooper/Jeremy Irons scenes. They shot the film in 25 days. 16:10 Klugman talks about working on Tron: Legacy. He and Lee Sternthal wrote an early draft of the script. 17:08 How did their version of Tron: Legacy differ from the finished version? Says their draft was quite a bit darker.